Winter is coming soon, and in many parts of the country, people may be choosing to close their hot tubs for the season. It may be that the tub is part of your vacation home and will be unattended for three or more months. Others may simply choose not to brave the cold to get in that relaxing warm water. Regardless of the reason, you should focus on protecting the filters, pumps, and other equipment from the cold. Here are a few tips to do the job correctly. Make sure the hot tub is dry. While some manufacturers may have specific steps to take, the process for winterizing a hot tub is simple. First, turn everything off and unplug the hot tub. You will be draining it, and water and electricity do not mix. Make sure extension cords are out of the way (or plugged into the shop vac you’ll be using). Then, drain the tub. You can use a sump pump for this step or simply the drain plug. Some may let you attach a garden hose to drain to a more convenient space on the lawn or driveway. The sump pump, however, will work faster than the drain plug. Regardless, remove the drain plug. If your hot tub has an air blower, you should get the water out of it. 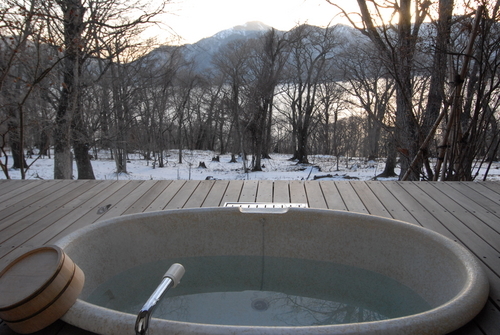 Turn off the heater, cover the tub, and then plug the hot tub back in. Turn it on. The air blower will start, and you should let it run for 30 seconds to a minute. Shut the power back off, and unplug the tub and stow any cords for the season. Make sure the hot tub is clean. Remove filters and clean them. The filter well should be dry—a sponge or shop vac will make that happen. Also, remove all drain plugs and loosen any fittings—if condensation occurs, you want everything to drain properly. Using the shop vac, blow out all the pipes. Set the shop vac to blow, rather than provide suction. Blow through all the pipes several times. You will find you have some water left in the tub. At this point, clean the tub thoroughly, rinse it (if required by the cleaner), and shop vac the tub to make sure it is completely dry. At this time, you should also clean the cover top and bottom. When everything is dry, put the cover back on and lock it tight to the tub. Nothing can get in, and the winter winds will not blow the cover into the neighbor’s yard. You may want to get into the tub with paper towels to dry every surface you can. While you are in the tub, you can use a non-toxic spa antifreeze in the filter areas and pump discharges. Wooden hot tubs should not be completely drained of water. The wood requires water saturation—the water prevents the wood from shrinking, leading to leaks. 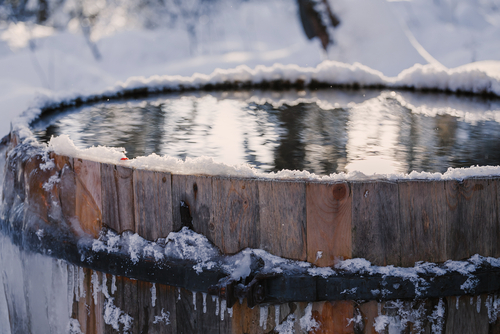 Leave around 3” of water in the bottom, and add a non-toxic spa antifreeze to prevent any freezing. Blow the water out of the jet lines, blower, and pumps. Cover it and check it frequently (every two weeks) to make sure the water is still there. Keep the hot tub open for winter use. 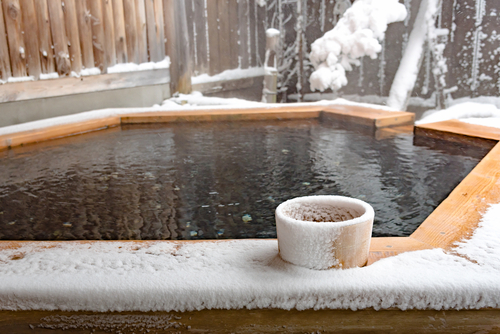 One thing you might want to consider is keeping the hot tub ready to use in the winter. Even if you don’t use it, you will save several hours of work, and the added cost to your utility bills will be minimal. This tradeoff may be worth it to you. If you do leave it set up over the winter, you still need to take a few steps to prepare it. First, take advantage of a warm November day to drain, clean, and refill the tub. This cleaning can be part of your regular maintenance cycle. If the cover is not in decent shape, consider replacing it. A new cover will insulate better and will be easier to manage. Check the cover latches; replace any that are damaged or missing. Clean the cover. A high-quality cover will help keep costs low. The insulation benefits will outweigh the expense. You may also want to buy a thermal blanket for the hot tub, which will reduce costs further. Keep the hot tub at a constant temperature, ready for use. If you end up using it frequently, you will use less energy and place less strain on the pumps. The higher temperature will also help prevent freezing in the event of a long-term power loss. You must check the water level frequently, which you can do by using the tub regularly. 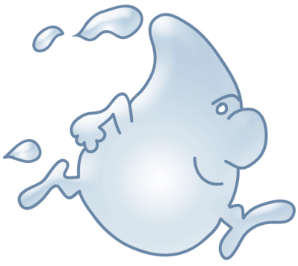 Continue to treat the water as you would during the summer season. If the tub is at your year-round home, there’s really no reason to close it for the winter. If you’ve kept it and the equipment clean, the added expense of keeping the tub going is offset by the time saved in the emptying, cleaning, and filling process. And, you’ll be able to take that long warm soak even while the snow falls!